The Supplemental Nutrition Assistance Program (SNAP) — known as CalFresh in California — will provide food assistance to an estimated 4 million Californians on average each month during the 2017-18 state fiscal year. 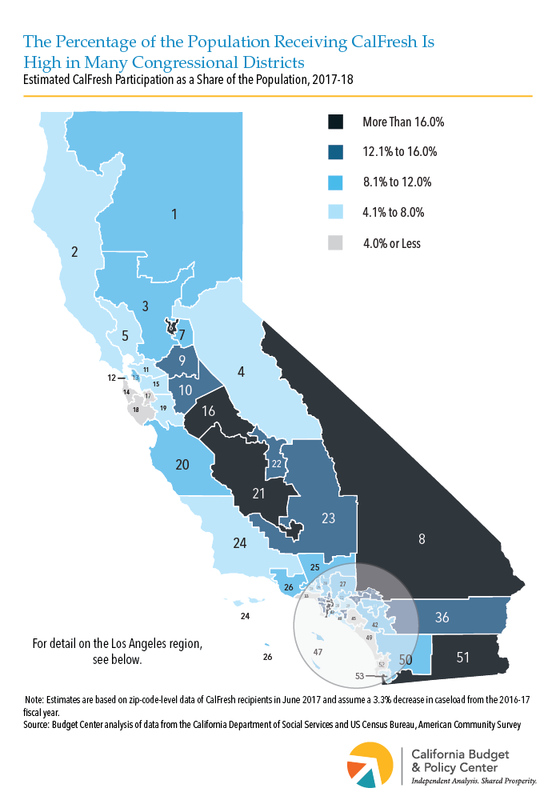 The percentage of Californians receiving CalFresh varies across the state’s 53 House districts but is especially high in the San Joaquin Valley. For example, an estimated 1 in 4 people will receive CalFresh benefits in both the 21st District (R-Valadao) and the 16th District (D-Costa) (see Map 1 below). 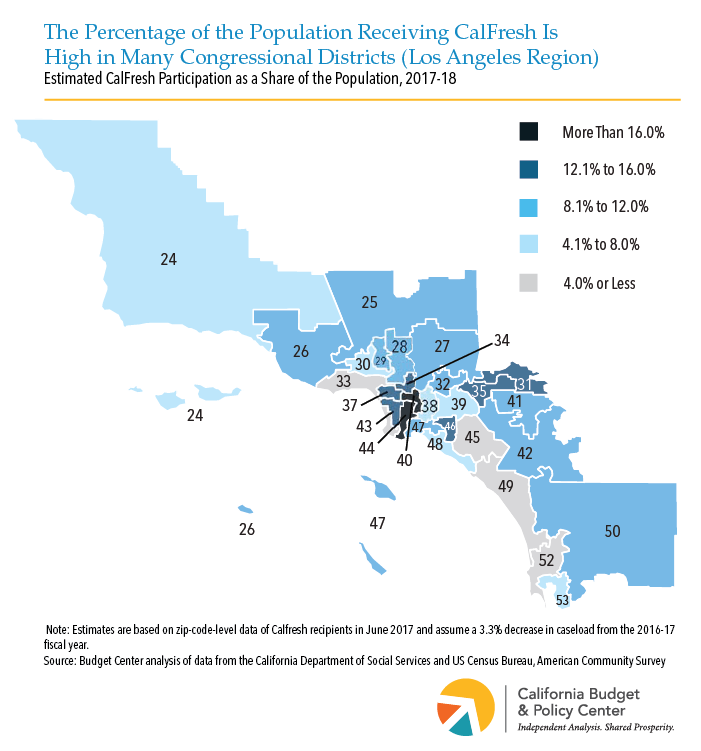 In contrast, the share of residents receiving CalFresh benefits is smaller in higher-income, coastal districts such as the 33rd District (D-Lieu), where just 2 out of every 100 individuals are enrolled in CalFresh (see Map 2 below). The Farm Bill authorizes funding for SNAP and other food and agriculture programs and will expire later this year. Federal reauthorization of the Farm Bill presents an opportunity to expand SNAP’s powerful and cost-effective antipoverty effects. 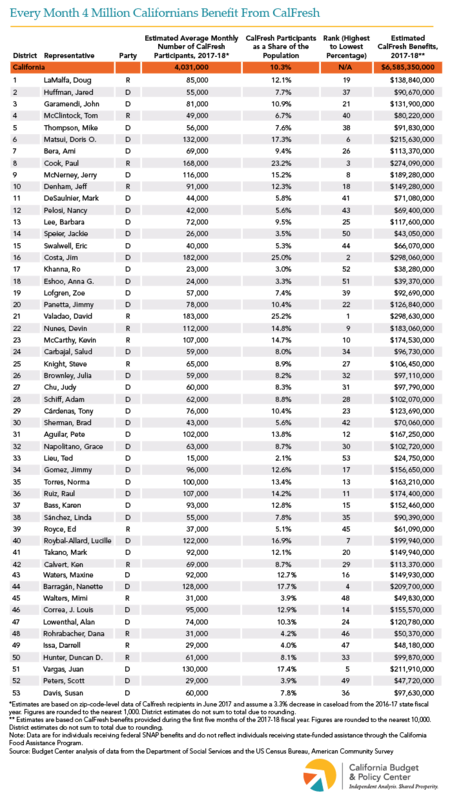 However, Republican leaders in Congress have set a goal of substantially scaling back federal support for SNAP. Moreover, President Trump’s proposed budget for federal fiscal year 2019 — which begins on October 1 — would cut SNAP funding by nearly 30% over the next 10 years by restructuring the program and limiting benefits and eligibility. Cuts of this magnitude would increase hunger among children, seniors, and individuals with disabilities.